*Affiliate links used in this post. Thank you for supporting the writing here at Beloved Nest! Our girl is infatuated with Mickey Mouse Clubhouse. Infatuated, I tell you. No lie, the first word I hear when I lift her out of the crib every morning is “Mickey?” And while playing with her toys she randomly breaks out in a sing-song voice exclaiming, “Oh toooodles!” This is a real situation, people. It’s as if they’ve cast a spell on her with their “Meeska-Mooska-Mickeeeey-Mouse!” chants. But who am I to keep a girl from her true love? 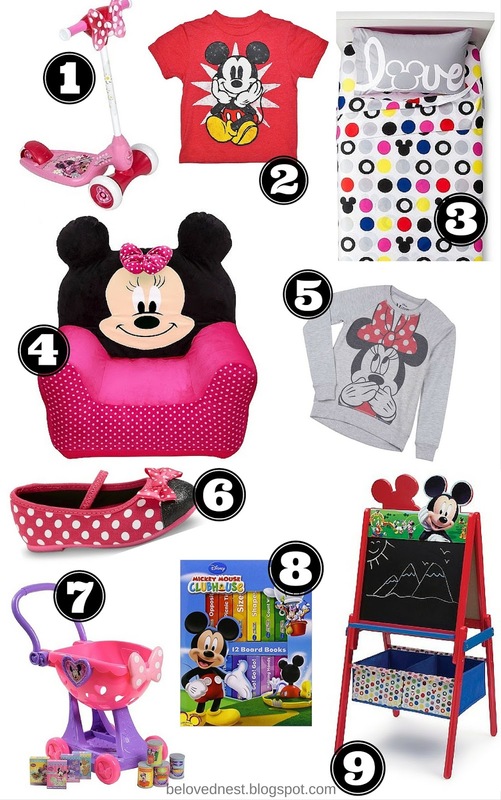 So of course I’ve been searching for some cute (read: non-cheesy) Mickey and Minnie gifts for Christmas and her upcoming February birthday. And since I know a lot of you have little Mouse-lovers in your home too, I thought I would share my favorite finds with you. This is a touch too “grown” for my girl, but I love the three-wheel feature. Might be on the list for next Christmas. This is actually a boys tee but I bought it in Aven’s size because it was too adorable to pass up. Seriously love this pattern and how it isn’t overtly Mickey or cartoonish. We have one of these, and it’s as cute as it looks in the picture. 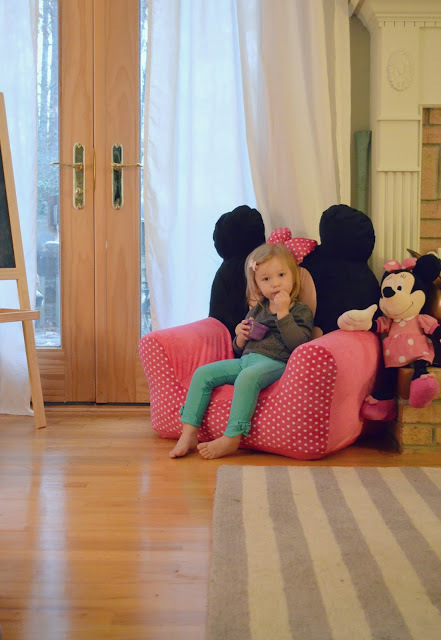 It’s inflatable with a washable cover and is the perfect spot for Aven to hang out while she watches tv (can you guess her show of choice? ), eats a snack, or reads books. Sometimes I catch her turned around facing the back of the chair so she can “talk” to her friend Minnie or give her kisses. That alone is reason enough to own this chair. Just the sweetest thing you’ve ever seen. Although this sweater is a few sizes too big for Aven right now, with that cute Minnie face I almost want to snag it now and hold on to it for later! If we owned these, I guarantee you my child would insist on wearing them every day. Aven is getting the CUTEST vintage-style kitchen for Christmas, so she would flip out over this shopping cart to use with her kitchen. For every day leading up to Christmas, I’m going to have a book for her to open. This is a set of 12 books, so that covers about half the days! I’m excited to see my tiny bookworm’s reaction to these. We have an easel similar to this and it is one of her favorite things to play with, especially the chalkboard side since the cold weather is forcing us away from our beloved sidewalk chalk. As I wrap up this post, I am incredibly tempted to break out in the “Hot Dog” song and dance, but I will spare you. Just know that it’s on repeat in my head right now (and always, actually). I’m sure you can relate! I hereby grant you permission to give in to the Mouse obsession. Welcome to the clubhouse. 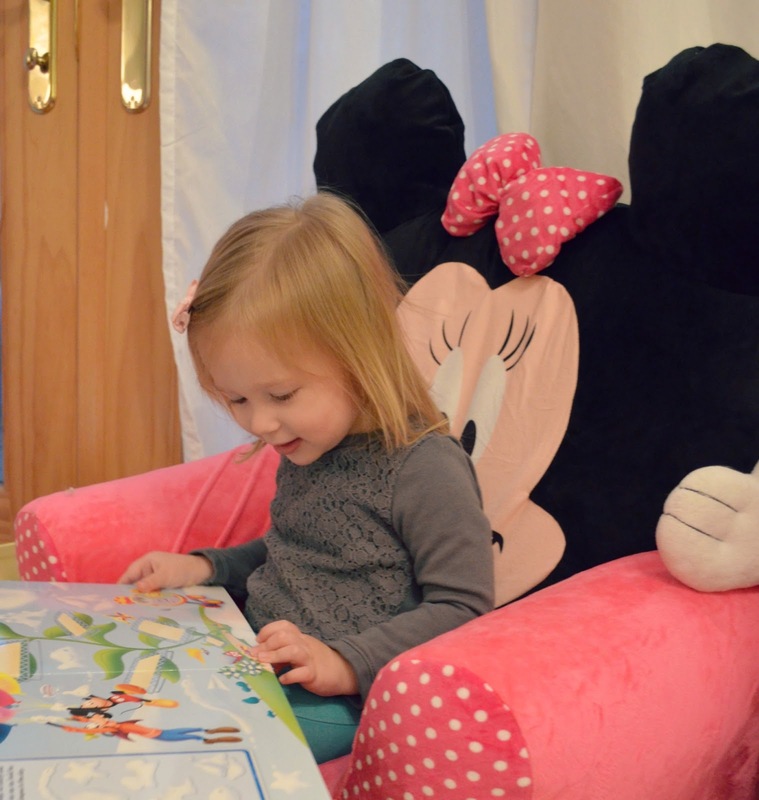 *Disclaimer: We received the Delta Children Club Chair for review as part of the Savvy Sassy Moms Product Scout program. All opinions are my own!